LOS ANGELES -- If a golden retriever gives birth, gets stung by a bee or sprayed by a skunk, veterinarians want to know. Scientists are studying the popular breed to find out why their lifespans have gotten shorter over the years and why cancer is so prevalent. The Colorado-based Morris Animal Foundation recently got the first lifetime study of 3,000 purebred golden retrievers up and running after signing up the first dogs in 2012. The nonprofit says the review of health conditions and environmental factors facing goldens across the U.S. can help other breeds and even people, because humans carry 95 percent of the same DNA. "Canine cancer has become a dog owner's greatest fear," said Dr. David Haworth, president and CEO of the foundation, which invested $25 million in the study. "You don't see dogs running loose that much anymore, we don't see a lot of infectious diseases, and the vaccines we have today are very good, so our concerns are warranted." The vets haven't learned enough yet to improve or prolong the retrievers' lives, but key factors could lie anywhere, said Dr. Michael Lappin, who has 19 patients from Buzzards Bay, Massachusetts, in the study. 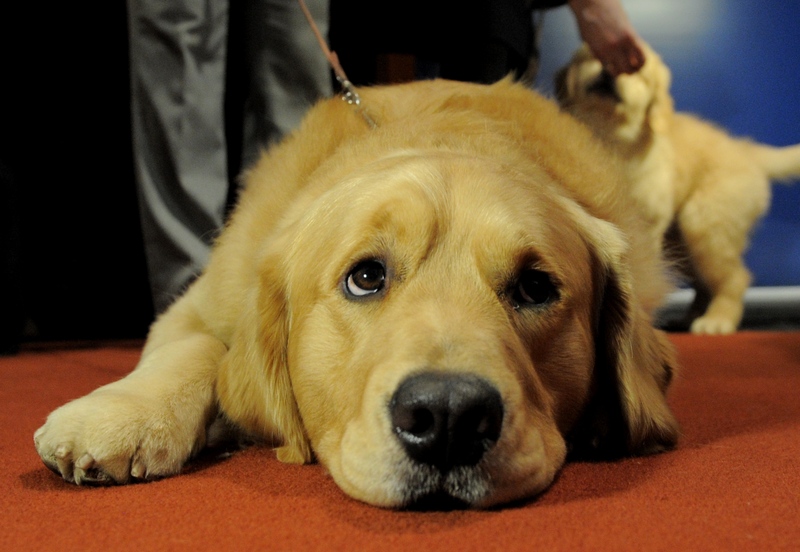 When he graduated from veterinary school in 1972, golden retrievers lived 16 or 17 years. Today, it's nine or 10 years. Lappin plans to get his families together in a few months to see if they have found ways to make life easier for their dogs, especially because the most helpful data about cancer, obesity, diabetes and other chronic conditions won't emerge for six or seven years, researchers say. Early exams showed 33 percent of the dogs, which are 1 to 5 years old, had skin disease or ear infections; 17 percent had gastrointestinal illnesses; and 11 percent had urinary disease. The dogs get medication to treat the conditions, but vets can't treat them differently because it would skew the results, Lappin said. Marla Yetka of Denver says her nearly 2-year-old golden retriever, Snickers, joined the study and has been suffering from skin problems. Yetka uses oatmeal shampoo on her pet, but she's looking forward to talking with other participants about their remedies. "I have too many friends who have lost goldens," she said. "Is it what we are feeding them, their environments, their breeding?" Pet owners keep tabs on everything, from a move across country or across town, a change in climate or time zone, new children at home, different food or behavioral changes. Most keep journals so they don't constantly call the vets when their dog gets a thorn in its foot, eats a spider or devours a bunch of bologna if it tears into the groceries. The vets collect blood, waste, and hair and nail samples annually to test if the dogs get sick, hoping to uncover a common thread or early warning sign among dogs that develop cancer or other diseases. Doctors also check for changes in temperature, blood pressure, energy, diet, sleeping patterns or other factors that could explain illnesses. "Everyone involved will feel the burden it will take to be able to say, 'I am playing a role in stopping cancer in these animals I love,'" Haworth said. So far, seven goldens have died of conditions such as cancer and gastrointestinal problems, and one was hit by a car, Haworth said. Another dropped out when its owner died. The dogs come from every state; about half are male and half are female; and half are fixed and half are not. Those who brought dogs into the study, including both veterinarians, hope goldens get a shot at the longer life they used to enjoy. "I'm glad I found the study and feel in some small way, I might make a difference," Yetka said.